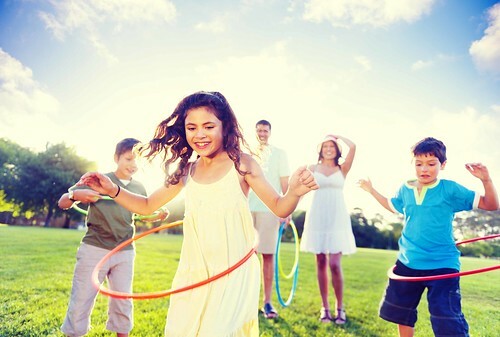 MyPlate has new resources for families working together toward a healthier lifestyle. It’s that time again…back-to-school season is upon us. It’s an exciting time of year for kids, offering a new beginning with the promise of new friends and new experiences. It’s also a great time for families to establish a new routine and work together toward a healthier lifestyle. ChooseMyPlate.gov and Team Nutrition just launched new resources to help your family eat better together, including printable activity sheets, tips for making mealtimes fun and stress-free, and videos featuring real families who share healthy eating solutions that work for them. For example, meet Lilac and PJ. See how this family of five (and grandma too) makes healthy eating work, while incorporating their Laotian heritage and adjusting to the addition of a new baby. For younger children, try our MyPlate Grocery Store Bingo game during your next shopping trip. Kids can learn about the food groups while you shop. If your kids are picky eaters, try the MyPlate Food Critic activity to expose them to new flavors. In this activity, kids are empowered to pick out and rate a new food. For tweens and teens, the Kid’s Restaurant activity lets kids be the chef by planning and preparing a meal for their parents. 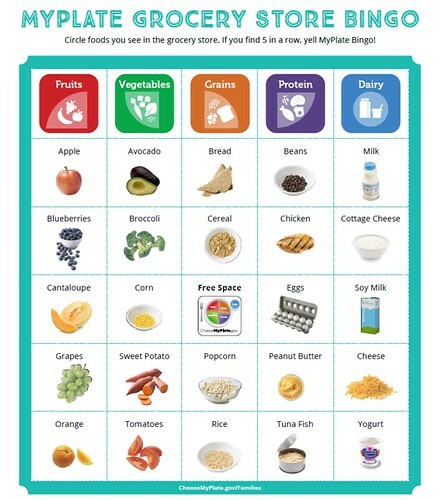 MyPlate Grocery Store Bingo is a great activity for kids accompanying mom or dad on a grocery shopping trip. These one-page handouts discuss how school meals help kids meet their nutritional needs and support learning. This handout for kindergarten parents introduces kids to school lunch and provides an activity for children to sort lunch foods into the five food groups. It also includes a “Color Adventure” challenge where families taste-test new fruits and vegetables of different colors. This booklet discusses ways to reduce, recover, and recycle food before it goes to waste. Get ideas for your school by reading tips for school nutrition professionals, teachers, parents, students, and school administrators. This colorful booklet provides an overview of Smart Snacks Standards and how to tell if a food and beverage meets the requirements. This is a ready-to-go resource for anyone that oversees the sale of foods/beverages to students on the school campus during the school day. For more healthy eating tips and resources, sign up for MyPlate email updates and the Team Nutrition E-Newsletter. 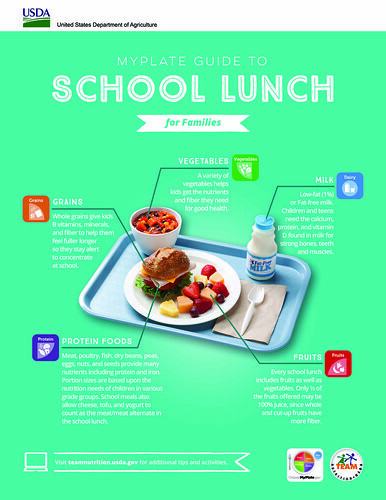 The new MyPlate Guide to School Lunch discusses how school meals help kids meet their nutritional needs and support learning. This is a great idea especially for busy people who don't have time to do the research and come up with ways to teach children lifelong good eating habits and make it fun. Thank you for caring and sharing. Excellent post with the MyPlate bingo. Very quick helper for busy families at the grocery store or market. I would like to get some free posters to put on the walls at the community college I go to how can I make this happen.